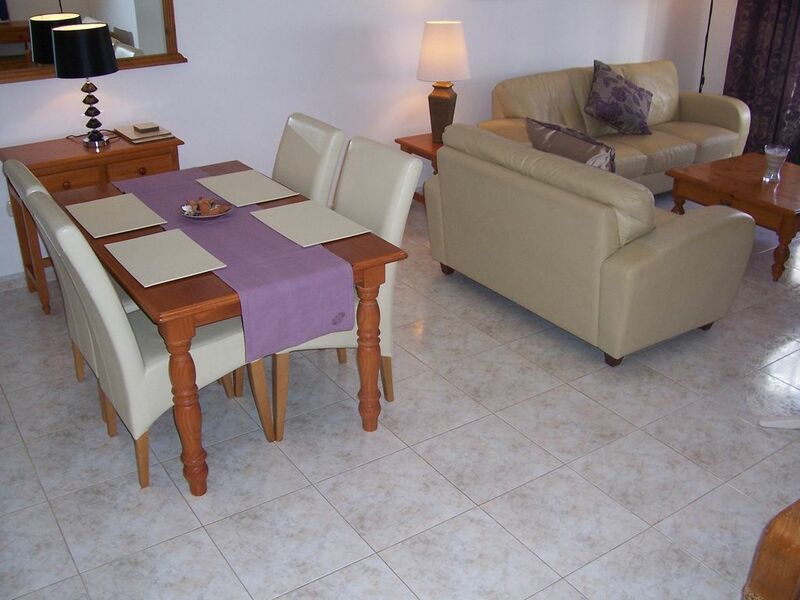 This is a lovely 2 bedroom apartment, newly refurbished, in a good location in the popular resort of Costa Teguise. The apartment consists of the master bedroom with 5 ft bed and the second bedroom with 2 twin beds of 3 ft each. The bathroom is complete with bath shower, bidet and wash hand basin with a vanity unit. The lovely sitting dining area consists dining table with 4 cream leather dining chairs, a cream leather 3+2 sofa combination, flat screen TV and DVD player, and a quiet little corner for reading or listening to some laid back music on stereo system. The kitchen come fully fitted with oven, hob, microwave, kettle, toaster, iron, ironing board and the washing machine is located in the solana along with the clothes line. The sitting area looks out onto the patio area which had a table with 4 reclining chair and and umbrella. Also on the terrace, are the 4 sun loungers for lazy days under the blue sky. The apartment also has it own individual parking space. The apartment also has its own designated parking space. This was by far the best apartment we stayed in,very spacious and a large south facing terrace overlooking the pool and the sea in the distance. We thought it was the kind of property you could live in permanently,very comfy sofas where you could watch English tv stations. The bedrooms were of a good size and the beds were very comfortable. Maybe the bathroom would have been better if it had a window and the water for a bath did not stay hot for too long but maybe it was because it was December not so much daylight for the solar panels.The apartments are set in a quiet complex in a quiet area with a 15 minue walk to the main beach. There is a large spar supermarket around the corner with bars and resturants in the same area so you don,nt have to go all the way to the main square if you don,t want to.every night..We would not hesitate in staying at this apartment again. I really loved the size of the apartment both internally and externally. The living area was huge, light and airy with a flat screen TV showing English channels. Both bedrooms were a good size with plenty of storage space. Bathroom and kitchen were good and well equipped. My favourite space was the terrace which was huge and overlooked the pool and had a sea view. The terrace was a sun trap and perfect for private sunbathing. The location was fine for us being a 20 minute stroll to the centre and only five minutes to a supermarket and some bars. The welcome pack was handy but personally I would have ditched the wine and replaced it with salt and pepper, an extra toilet roll and a couple of bin liners. I had a couple of issues over the two weeks which were quickly sorted out with a text to Mel the property manager. I would definitely come back and think the owner's have addressed issues raised in other reviews which shows their commitment to improvement. The only thing missing is WiFi but I'm ignorant of the installation and running costs in Lanzarote which could be prohibitive, hence 4 not 5 stars. In conclusion a great property which I enjoyed a lot. The apartment was very clean, with everything we needed for our break, the complex is very quiet and the swimming pool although unheated is still warm enough to use on October. Location is ideal a short walk from shops, bars and restaurants and not too far from the beach. A delightful stay and I would certainly be happy to return. enjoyed our stay in this lovely apartment.very clean and spacious with loads of wardrobe and drawer space.kitchen was well equipped with all items needed for cooking.we would have liked a safe for keeping passports money etc.not sure insurance would cover any losses for things not locked away.also no information for emergency numbers doctor etc.a very quiet complex in a quiet area very clean and well maintained.would not hesitate to return. The apartment is located about 10 min walk from the main beach of Playa Las Cucharas. This is a lovely beach for both adults and children alike, where you can enjoy windsurfing, swimming and making sand castles. There is a selection of shops and bars only 5 min walk from the apartment and the center of the resort is only 10-15 min walk, which boasts a market in Pueblo Marinero every Friday night. Costa Teguise also boasts the only water park on the island, which is a great day out for the family. There is also a great golf course to be had here in Costa Teguise. It is a well established course, and can prove to be a challenge to the best golfer at anytime. Occupancy is based on two people sharing. Each extra person is charged at £ 25.00 per person per week, adult or child.